An east Belfast business academy has created 110 quality jobs working with key national retailers for unemployed people in its first year of operation. RMS Inspire Academy has enabled RMS Ltd, which supplies specialist staff to large retail companies across the UK, Ireland and offshore, to record a turnover of £1.1m. Graduates of an accredited 4-week programme are guaranteed permanent jobs with RMS in merchandising, retail development and warehousing with top names like Tesco, Chain Reaction Cycles, B&Q, DFDS, Boots and ASDA. A selection of students were today presented with certificates by Gavin Robinson, MP for East Belfast, at a special graduation ceremony. 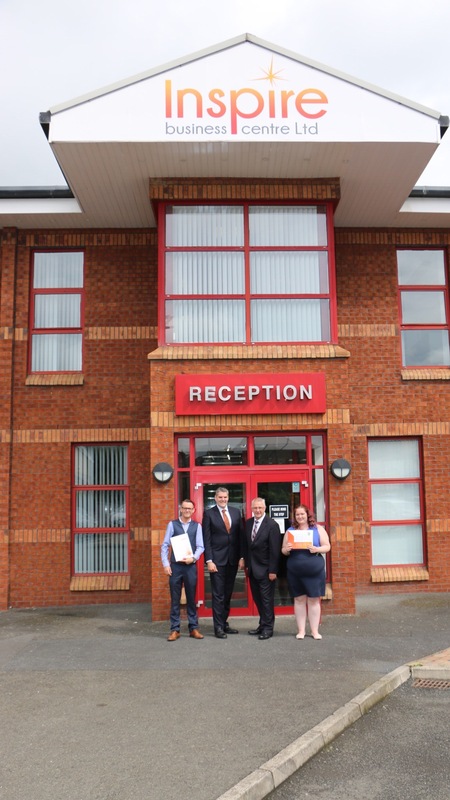 A partnership between Inspire Business Centre at Dundonald and Welsh outsourcing company RMS is behind the mould-breaking programme. The Academy aims to put another 150 local people into permanent employment across a range of skills in the next year and increase turnover to more than £2m. RMS and Inspire are now masterminding a plan to duplicate the success of the east Belfast project by setting up academies all around the UK. Inspire CEO Mark Brotherston said: “It was a natural fit. RMS supplies outsourced services to national retailers, while Inspire provides bespoke accredited training programmes required by RMS operatives. Inspire Business Centre has 70 tenants with 350 employees onsite and contributes £35m a year to the NI economy. Kieran Allmark, NI Manager for RMS said: “Our goal is to provide specialist outsourced staff to deliver end-to-end solutions for the retail sector. We have a high, ongoing demand for quality staff in a number of key areas, including warehousing, logistics, customer service, merchandising and project management. “Our partnership with Inspire ensures we are able to meet demand with graduates who have undergone accredited qualification programmes and are fully equipped to deliver on contracts across the UK and Ireland and in Jersey, Guernsey and the Isle of Man.